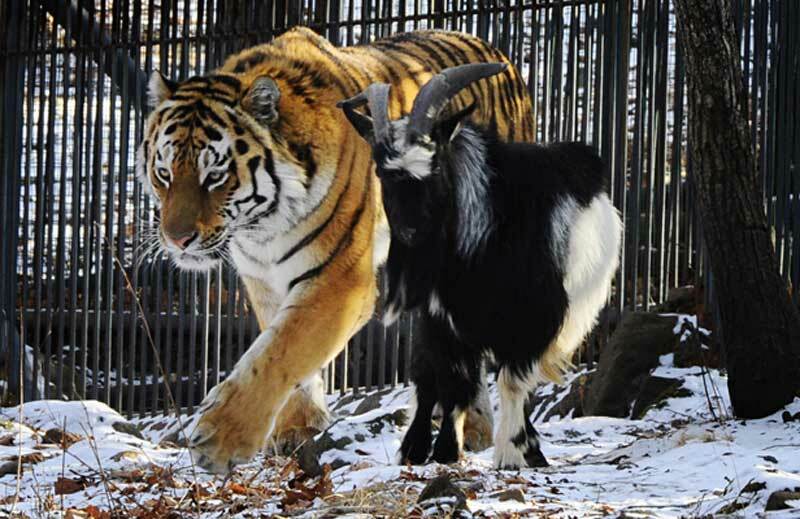 Russian prosecutors have begun considering whether media coverage of the unexpected friendship between a male tiger and goat at a safari park in the country’s far east counts as gay propaganda. 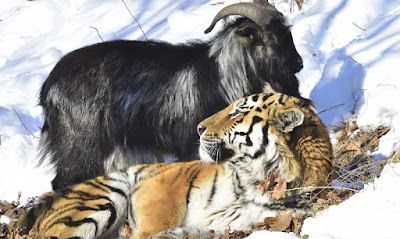 Novosibirsk lawyer Alexei Krestyanov complained to the prosecutor general last month that information about the animals living together could harm children by provoking “interest in non-traditional sexual relations”. “I think the positive coverage of this topic is nothing less than interference in the personal lives of minors, which is what hidden propaganda is, and public, active imposition of homosexuality,” Krestyanov wrote. The prosecutor’s office in the Primorsky region, which borders China and North Korea, has said it has begun checking Krestyanov’s allegations. 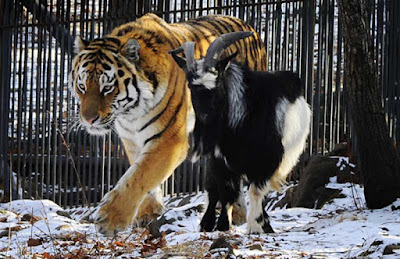 The two animals became minor national celebrities in November when Timur the goat, who was meant to be a live snack for Amur the Siberian tiger, instead took over the enclosure at a safari park near Vladivostok, forcing the tiger to sleep on the roof of his own lean-to. The media was soon full of footage of the two playing together, and Timur’s fans have even begun a campaign to elect him to parliament, arguing that he would be braver and more honest than current MPs. Timur has been in the care of a veterinarian since late January after he tried to headbutt Amur, who took him by the neck with his fangs and gave him a shaking. Although Krestyanov cited a children’s rights law in his complaint, his language echoed that of the law against gay propaganda passed in 2012 amid President Vladimir Putin’s growing emphasis on traditional values. I'm sure Freud would have something to say about suppressed feelings there! I thought the story about Elsa was ridiculous until I read this one. Why must we put labels on every single living creature? Now two males can't hang out together without it being homosexual in nature? So friggin' stupid. I'm surprised the guy isn't worried about beastiality, too. Ha Ha! Good one, Barbwire.